No landings, no complex controls. It’s not a flight simulator but pure and simple arcade flying — plus there are dragons! 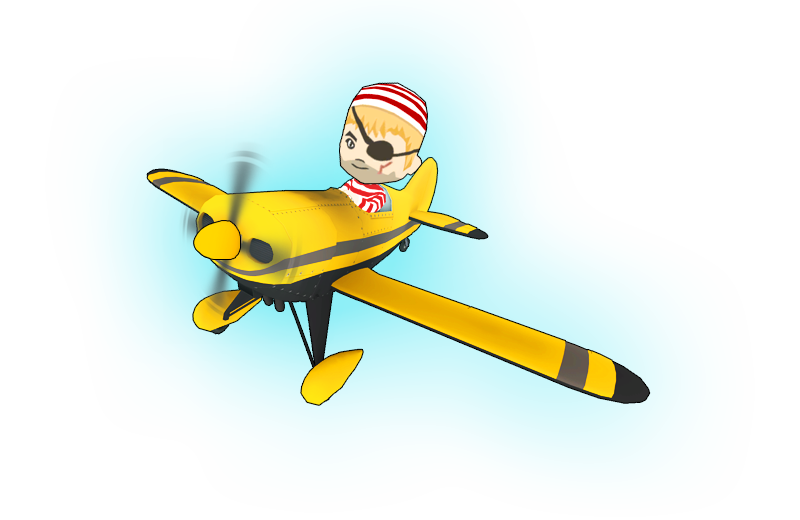 So don’t be afraid of heights or motion sickness, Pirate Flight (VR) runs in 90 FPS and offers a default comfort mode, which makes for happy flying in VR! The PlayStation®VR community asked for more features to satisfy the pro gamers who love a real challenge. Of course they were not ignored, the first patch includes the option to switch blinders completely off, gives experienced pilots a physically correct flight model, offers better weapons to make long-range trick shots, presents a new difficulty setting and – most important – now supports listening to your favorite Spotify playlists while playing the game! The complete game was remastered, all worlds now have realtime lighting and use a flat shaded low poly style. Additionally new control features were added, the controls for left-right (yaw) and ailerons (roll) can now be switch between the sticks. Seasoned VR pilots are in full control of all three axes for real flight (roll, yaw, pitch). PlayStation®4 system, PlayStation®VR and PlayStation®Camera are required to experience VR functionality. Please review and follow all safety guidelines for use of PlayStation®VR. PlayStation®VR is not for use by children under age 12. ‘PlayStation’ is a registered trademark of Sony Interactive Entertainment Inc.